Want to book a car? Fill in the form below & ask one of our car hire consultants for the best deal! Avis is a leading international car rental agency with branches in South Africa - Avis was voted as being the World's Leading Car Hire Brand at the World Travel Awards. You can hire an Avis car across South Africa's major centres - Cape Town, Johannesburg, Durban and more. Avis South Africa is part of the Barloworld Group, and has some 37% of the South African car rental market. On the 1st March 2018 Avis Sandton is moving across the road from the Gautrain Sandton station to level B3 of the Old Mutual Building, on the corner of West Street and Rivonia Road. Save on wifi - 30% off February, with the device available from R69/day at selected branches. 20 July 2017. Avis in the USA have launched a service where customers can make a booking on their smartphones, pay, locate their vehicles in the rental parking area with their phone, unlock their car with their smartphone and then drive off...without having to go anywhere near a counter and its queue. This is similar to what Bidvest Car Rental are doing with their Snappdrive App. “With three of the largest rental locations outside the US, it’s a no-brainer that South Africa will see this functionality roll out here within the next 12 to 24 months,” said Lance Smith, the executive for marketing & sales in southern Africa. 9 Nov 2017. Avis International have begun rolling out voice-activated digital reservations. Whilst this is not available yet in South Africa, the plan is eventually to launch here as well. You'll be able to submit verbal commands such as : "I need a car to hire this Monday in Cape Town". 5 June 2017. Avis Budget have been named, by the ACC (Association of Corporate Counsel) as their 2017 Value Champion. 15 May 2017. Barloworld, who run the Avis and Budget car ental brand in South Africa and the Avis Fleet; released its interim results to 31 March 2017. On the car rental side they've achieved fleet utilisation higher than 75%, over 90% customer satisfaction, increased revenue by 14%, car rental revenue per day went up 2%. They are predicting more increases in car rentals from foreign in-bound tourism. Barloworld also provides long-term leases of cars and fleet management services via their Avis Fleet. Revenue from the Avis Fleet increased by 5% to R1 688m, with operating profit up 12%, reaching R292m. 24 Feb 2015. Avis have appointed Rainer Gottchick as their Chief Executive for southern Africa, from the 1st March 2015. Gottschick fills the boots of Keith Rankin, who has risen in the ranks to Chief Exec of Barloworld Automotive (a 100% owned subsidary of the Barloworld, which is listed on the JSE). 11 Feb 2015. 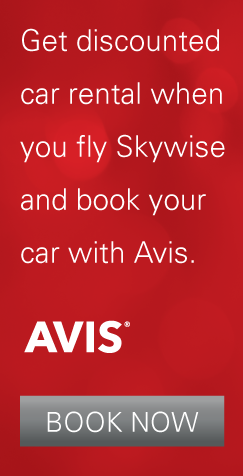 Skywise Airline launched its ticket sales today, and the airline chose Avis as its official partner. Here's a what their ad banner looks like (see right): "Get discounted car rental when you fly Skywise & book your car with Avis". 4 Feb 2015. Barloworld, who run the Avis brand in South Africa, report that "Rental days and rate per day in car rental are ahead of last year contributing to a good trading performance" (in the last quarter of 2014). 27 Oct 2014. At an event for the Avis Car Hire Awards for 2014 in the Europe, Africa & Middle-East areas, Avis SA was recognised for its excellent customer service & growth. 4 March 2014 Avis launched their latest competition at the end of February- an all expenses paid trip to Cape Town on the 9th of March and a chauffeur ride for the entire Cape Argus Cycle Tour. To enter, potential winners need to share their dream destination that they would want to be chauffeur driven to or send in a review of their latest experience with the Avis Point 2 Point chauffeur service. On the day the winner will enjoy all the comforts of a regular couch potato including a minibar, a water pistol to shoot at passing cyclists, photo opportunities and a free lunch. This is the one and only way to complete the Pick ‘n Pay Argus Cycle Tour without having done any training. A chauffeur driven cycle tour is a great idea for a prize. Winners get to experience all that the beautiful Cape has to offer with the greatest of ease. 3 Feb. 2014 Avis won first place at the 2014 Airports Company South Africa (ACSA) Feather Awards for motor vehicle rental at George, Cape Town International, and Bloemfontein airports. The prize was awarded for excellent service in the Car Hire Service Provider Category. Keith Rankin, the Chief Executive for Avis Rent a Car Southern Africa commented on the award; “Avis is honoured to be a part of enhancing the South African travel industry’s reputation in terms of service delivery and hospitality. This award is recognition that our service is on par with that received by travellers from first world countries. It is truly an honour to be awarded this prestigious award; it serves as a motivation for all Avis ambassadors to keep on trying harder." Over the years many of South Africa’s car rental agencies, from all over the country, have been recognized with feather awards for great service. First Car Rental’s Uppington Airport branch took the cake 3 years in a row from 2010 to 2012, with Europcar the overall winner in 2010. Also worth a mention is Woodford groups’ win in both 2006 and 2008 for their PE Airport branch. However, this is just the tip of the ice-berg for Avis - they have received many an award in 2013 and are proud to be recognised for providing customer service of the highest quality. They even went as far as getting involved in the LoveLife program, SA’s largest project for the education and prevention of HIV/AIDS. They have donated a car for the use of helping LoveLife to spread awareness about these conditions and other related diseases. Not only does this say a lot about the ethics that the Avis brand lives buy, but it makes clear the fact that they care more about people and less about meeting sales targets. Not your average car rental company! 27 Nov. 2013 Keith Rankin, chief executive of Avis South Africa, issued a statement in which he confirms their support in the upgrade of national roads. He explained that Avis has invested notably in their systems and human resources to ensure that clients' rental experience will continue to be as "seamless as possible." The e-tags installed in the rental vehicles will charge the standard e-toll rate, (a maximum of R450 a month), which will be slightly higher than what registered e-tag users pay, but will account for the cost of putting systems and resources into effect. The final invoice would show the e-toll charge and will be available 48 hours after returning the rental vehicle. Minister of Transport, Dipuo Peters, revealed last week that e-tolling on the highways in Gauteng will start on 3 December. 8 Nov. 2013 Avis has added a Mercedes E250 CDI sedan and E250 convertible as well as the Ford ST3 to their range of vehicles. The Mercedes will be part of the luxury vehicles and the Ford will be up for rental in Cape Town and Durban in November. Clients can rent the car either as driving it themselves or a chaffeur drive. The BMW 3 series can be hired using the Point-2-Point service, where a chaffeur transfer is at your service 24 hours, any day of the week. It is charged per vehicle transfer and not per person driving. 15 October 2013. With a Customer Satisfaction Index (CSI) score of a soaring 91.8, Avis shows why they were declared as the winner in the car hire industry category in a recent poll. The Ask Afrika Index conducts interviews over 22 industries, 110 corporations and 33,000 people to examine the quality of customer service. This extensive research provides a platform for discussions on service trends and complaints of the South African consumer. "Being awarded the winners in the car rental industry in the Ask Afrika Orange Index is an honour and a great achievement which wouldn't be possible without the dedication of our Avis brand ambassadors. Avis will continue to maintain a high standard of service delivery in an effort to always try harder and exceed customer expectations". Did you know that you can purchase vehicles from Avis? You can even trade in your old vehicle to offset the cost of the purchase. As Avis takes superb care of the cars, you expect a well maintained vehicle. There are branches of Avis Car Sales in all the major cities : Bellville, Bloemfontein, Boksburg, Croydon, East London, Kempton Park, Parow, Pinetown, Pietermaritzburg, PE, Randburg (Johannesburg), Rivonia (only luxury vehicles), Roodepoort, Pretoria (Schoeman Street), Strand (Cape Town), Umhlanga Ridge (near Durban) and Wynberg. Avis makes Leribe's journeys "so pleasant to look forward to"
Review of Avis - Johannesburg Lanseria : we're off to a good start, having paid R973 for a Toyota Corolla for 2 days, as a result of booking it as part of our 1time flight. Avis Johannesburg car rental delight our daughter with their balloons, bunny (it was Easter) and friendliness. Avis Johannesburg review - I blitzed through to my Tiida and Holiday Inn. Further information about the group can be found on Wikipedia at Avis Rent a Car System.